Noreen Renier, psychic actress and author in Orlando, and previously a resident in North Carolina and Virginia, has a long history of multiple bankruptcies. And as a losing defendant across four federal courts in the U.S.A.
As a debtor Noreen Renier failed to initially report over $100,000 in income plus thousands of dollars in additional assets to one bankruptcy court in 2007. She also failed to even list her highest unpaid creditor on her bankruptcy filing! The judge in that court ordered a judgment against her citing Noreen Renier as having misled his court and not being a credible witness. In 2011 she lost a U.S. District court appeal arising from her 'not credible' judgment after her Chapter 7 filing. And in April 2012 the U.S. Court of Appeals for the Fourth Circuit rejected her second appeal. Those booking the services of "super psychic" Noreen Renier should take a very long pause before relying on her acting performances before TV cameras and her "highly credible" visions and forecasting. She has boldly fooled many. This latest Chapter 7 bankruptcy filing by current Orlando Florida based author, medium, and claimed "police psychic" detective Noreen Renier follows her Chapter 7 filing nine years earlier. It also follows a string of six federal judges all ruling against her across four federal courts from 2006 to 2012. Federal court granted subpoenas on behalf of one creditor owed more than $42,000.00 from Noreen Renier also uncovered many unreported payments made from TV series producers to Noreen Renier. Payments that represented apparently the majority of income in some years for Noreen Renier. The same subpoena's also revealed that her claims of being hired and paid from law enforcement agencies across years is clearly untrue. Noreen Renier declared her most recent bankruptcy in the U.S. Bankruptcy Court for the Western District of Virginia, Lynchburg Division on August 28, 2007. Thousands of dollars more in additional book royalty payments collected from her publishers were also distributed. Subpoenas allowed by the U.S. Bankruptcy Court provided thousands of banking, brokerage, and business transactions across hundreds of documents. And those materials quickly made it evident that her original income filings to the U.S. Bankruptcy Court were far from accurate. Ms. Renier's claimed income on both her original and first amended filings for the entire year 2006 as an example was understated at $6371. Her principal creditor showed with subpoenaed banking information that the amount was actually greater by a minimum of 10 times more! Indeed Renier actually revised her own original income figures on her updated 2007 Chapter 7 filing, adding more than $100,000.00 in additional income! "Her act of being destitute appears to have been a well rehearsed act. But then Renier herself is both a former professional stage actress and lounge entertainer" noted her key creditor. In a filing provided to the U.S. Bankruptcy Trustee and copied to the IRS by her principal creditor it stated "The enormous understatement of income on the debtor’s first two filings could not have been accidental or a simple mistake. A gross business income in 2006 of at least $67,720 could not possibly be mistaken for the $6,371 gross income that Petitioner declared on her initial and 1st amended filings. In addition, on her Means-Test, which she has never amended, the debtor indicates that her monthly income was $484 (her social security was a minimum of $559 per month, which is not even included in her gross income above), and that she was suffering an $850 loss each month on her business. She had to know that, on average, for the months preceding her bankruptcy that was not true." Additionally its noted that "The Debtor provided information about seven (7) accounts in her bankruptcy petition: four accounts at Wachovia Bank in Charlottesville, two retirement accounts (American Funds and Evergreen Investments), and a closed account at Bank of America in Tampa. However, the Debtor failed to identify her checking account at the Putt Putt branch of Bank of America in Charlottesville, which she closed just three months before she filed bankruptcy. It is difficult to believe that the debtor forgot the Charlottesville account, as more than $110,000 flowed through it from January 2005 to May 11, 2007." And continuing the 4-page brief single-spaced brief notes that "Because the debtor denies having a business in her bankruptcy petition (Statement of Financial Affairs, Question 18), and failed to answer Questions 19-25 on the Statement of Financial Affairs, I have no way to know if she has a business name or a federal tax ID number under which she may have additional accounts. In her February 15, 2010 Motion to Quash she notes “my employees records” and in her December 15, 2009 response to the Court Ms. Renier notes her “business” and acknowledged various personnel, including “Pat Stevens, Assistant to Noreen Renier”. Nothing in the subpoenaed materials suggest payroll disbursements, lending credence to the possibility of a business account." But according to her principal creditor at the time of her filing (August 28, 2007) and going back to sometime as early as January 1, 2005 Noreen Renier may have had a business or other unlisted account she failed to report. She failed to list any "business income" on her bankruptcy filing. Any failure to report such an account would be of significant interest to both the U.S. Bankruptcy Court (Lynchburg, VA), and the Internal Revenue Service. Confidential information and communications from anyone can be conducted through the U.S. Bankruptcy Court Trustee, Mr. William Schneider of Lynchburg, Virginia. Of note by her creditor in the filing is the statement "The Debtor [Noreen Renier] had / has a safety deposit box at Bank of America for at least three years prior to the filing of the bankruptcy. The account information on account #RN6048 shows automatic renewal payments of $90 each year in May of 2005 and 2006. The Debtor claimed to own no real estate, no stocks or bonds, no life insurance policies, no jewelry, or anything else of value. Why a safety deposit box? As we know that the Debtor dealt with large sums of cash it would be interesting to know how often she signed in to access her safety deposit box." And "A significant drop in deposits, and no large withdrawals, including rent payments, could be easily explained by the existence of another account, possibly the one at Bank of America on Barracks Road (acct. #RN6854) where she made a 1,500 cash deposit on August 7, 2006 into that account which is listed under an unknown name. There is also the question of the $4,000 check she wrote on July 19, 2007 – five weeks before she filed for bankruptcy. Where did that money go? According to her signed petition, it did not go to creditors. Nor to friends and family. Nor to her attorney. Nor to a trust fund. Nor for household goods. Nor for a new car. Nor into real estate holdings or repairs. Where did it go? Deposited into an unknown account? Converted to cash? There is no way to know without looking at the check." On the final page of his statement her creditor states " The best evidence that Debtor had another account may in her own filings. On her second amended filing, she significantly increased the amount of gross income that she had received in 2005, 2006, and 2007. However, even her second amended filings can now be shown as significantly below her actual deposits for two of those years. In 2005, her deposits, not including social security, interest, and dividends, still exceeded her 2nd amended earnings by almost $13,000. In 2006, her actual deposits and cash withholdings exceeded her 2nd amended earnings by over $17,000. Yet, her revised earnings for 2007 exceed the amount of her known deposits. Given her history of vastly understating her gross income, which suggests that there is additional income somewhere - in an account, a safety deposit box, or under her mattress." Of interest among the income found during an extensive subpoena process were checks from a variety of TV production and studio companies including from Story House Productions in Washington, D.C. (the producers of the TV series 'Psychic Detectives'), New Dominion Pictures, LLC "Psy" in Suffolk, Virginia; and also Max Weissman Productions dba Departure Films, in New York City. Just a sample of a few of the many checks from $1000 to $6000 each are shown above. 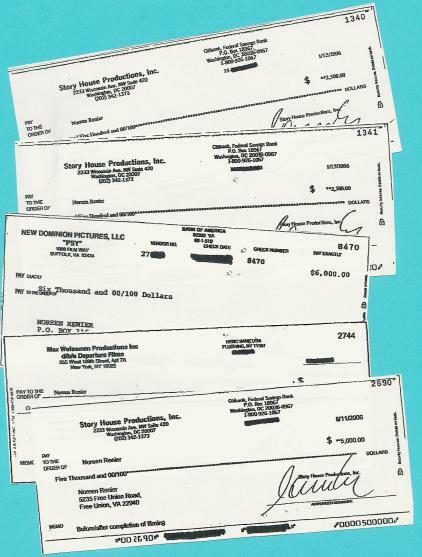 Though Renier's original bankruptcy filing claimed less than $6400 in total income for the year 2006, just three of the checks shown here go well beyond that amount and are just part of a series of payments exceeding $20,000 from Story House Productions alone. Another surprise is the complete lack of referenced payments across almost three years surveyed by the subpoenas for income coming from public law enforcement agencies --- a significant source of employment repeatedly claimed by Renier to the public. No designated deposit, check, or transfer made across her numerous listed accounts references a law enforcement agency payment from any county, state, federal, or overseas law enforcement agency. Yet her own web site as of April 3, 2011 states "she is a highly respected psychic detective who has worked on over 600 unsolved cases with city, county, and state Law Enforcement Agencies in 38 states and 6 foreign countries." And she claims "60-70%" of her cases are directly booked by such agencies. Given the significance of this income how was it overlooked? And if payments from law enforcement agencies were made how were they reported and under which account? And if they don't exist why then has Renier claimed that "60-70%" of her cases are booked and paid directly by law enforcement agencies? Her standard fee is $1000 for work with such agencies --- an amount which works out to about $9 a minute for psychic telephone reading and consultation service. Her critic notes "she seems to want to have it both ways" but things don't seem to square. Ultimately we may never know how much Noreen Renier has received from being entertainment "talent" and filming TV productions. Story House improperly failed to respond to a court ordered subpoena but information was gained from several banking sources including checks they issued to Renier. It's apparent based on documents that Noreen Renier's income in providing entertaining TV stories seem a principal source of income during the years covered by the subpoenas, rather than other income that is documented and referenced across the banking and financial accounts supplied by Renier. There appears to be a complete absence of any income coming from state law enforcement agencies or at least at levels referenced by Noreen Renier --- so either her public claims are exaggerated or those income sources aren't apparent in her banking statements. In late March 2011 Noreen Renier as a defendant and Chapter 7 debtor requested that a U.S. District Court in Virginia review the U.S. Bankruptcy Court judgment ruling against her ordered by Judge William Anderson. On July 22, 2011 the Honorable Norman K. Moon, a U.S. District Court judge issued a court memorandum rejecting Noreen Renier's 42-page appeal, but Ms. Renier then appealed that decision. But on April 18, 2012 federal Circuit Court judges James Harvie Wilkinson III and Andre Davis, and Senior Circuit Judge Clyde Hamilton once again issued a judgment order rejecting Noreen Renier's now 69-page appeal. Their ruling was made in the U.S. Court of Appeals for the Fourth Circuit (a court immediately under the U.S. Supreme Court). And their order kept in place the earlier 2011 federal court judgment which found Noreen Renier not credible and having misled a federal court. All the rulings, and additional 2006 and 2007 judgments against Noreen Renier made in a Washington based U.S. District Court were rulings favoring Renier's principal critic. Noreen Renier lived previously in the Charlottesville, Virginia area, and Wilmington, North Carolina, and now in 2014 is a resident of Orlando, Florida. Thus, at this time the ruling by federal judge William Anderson who found Noreen Renier to have misled his court and not to have been a credible witness continues to stand. And Noreen Renier has apparently decided a Supreme Court appeal is a dead end. One can suspect there are now ever larger numbers of the public who are concerned that "police psychic investigator" Noreen Renier is not credible. Including unpaid creditors. This material was previously published and appears for the public record on a subset of the GlobalNetResearch.com web site.